This is a perfect stocking stuffer for any horse lover who likes to be out on the trails. Always stay ready with this 28-piece customized compact first aid kit that includes scissors, tweezers, one cold pack, 20 bandages (ten 3” bandages and ten 2.75” bandages) and four antiseptic swipes – everything packed into a zipped nylon case. Additionally, each first aid kits come with a 1lb bag of tasty peppermint flavored Uckele equine treats. 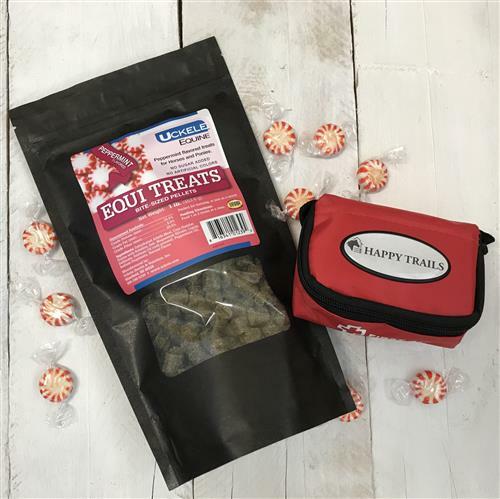 Reward your horse without disrupting healthy blood sugar levels with these delicious bite-sized pellets; they have no added sugar or artificial colors. Wholesome treats have a tasty alfalfa base.